It came to our attention on Thursday of last week that Zebra Finance Ltd have ceased all lending for new or renewing clients. This is due to their funding bank R. Raphael & Sons PLC having their banking licence revoked from the Bank of England and are therefore being wound up. This has significant affects in the short term as the club have been using Zebra Finance as our preferred lender for membership subscription direct debits, but we hope to have a new company to replace Zebra as soon as possible. If you applied for your membership finance before 15th March you shouldn’t have been impacted by this, as Zebra have told us that it only affected applications from this point, and that previous applications had already had their funding allocated. Zebra have also told us that they have been in touch with every applicant that has been affected, so members should know their individual situation. In the short term, we are continuing to honour all membership rights to all members who have attempted to renew with Zebra, and as soon as we have confirmation of a new funding company we will inform everyone affected and have them apply with the new company. We apologise for any inconvenience caused by this situation, but we were kept completely in the dark on the matter by Zebra Finance and had no warning of anything happening of this nature, and we fully appreciate everyone’s patience while we get another finance company on board. NEW Chef's Specials are a hit at Nineteen Restaurant! Recently our Chef’s have re-introduced their weekly specials for our evening menu and so far they have been a huge hit with clients at Nineteen Restaurant & Bar. Book your table now by calling 01964 670112 and come and try them for yourself! WIN great prizes in our Members' FREE Monthly Prize Draw! To thank our awesome members for their loyalty, we have introduced a Monthly Members’ Prize Draw in which we’ll pick one member at random each month for a chosen prize, it’s that simple! The winner will be drawn on Monday 25th March, good luck! Join us for a Par 3 Competition before watching The Masters Par 3 on TV! On Wednesday 10th April we are holding a 9 Hole Par 3 Competition between 4-6pm, where members can come and test their short iron skills before coming back into the clubhouse and watching The Masters Par 3 Competition on the TV! Entry will be just £3 per person and cash prizes will be handed out on the night to the winners. We are looking for a new member to join the Competition and Handicap Committee on a two year term as our Volunteer Coordinator. If you would like to nominate someone please fill in a nomination slip in the clubhouse and put it into the ballot box on the bar. On 18th March the nominations will be gathered and a members vote will commence. It's the time of year again when we will be putting on a recruitment drive in order to attract new people to the golf and to the club. Our Taster Memberships have been very successful in the past and our new Head Professional Matt Daley is very keen to get started with the 2019 packages. Aimed at golf novices and beginners, our taster memberships are a perfect way to get a feel for golf, with a block of group lessons from Matt Daley, 800 driving range balls and two months’ of golf. It’s a crash course in golf! After the three month course has finished each person will have a good understanding of golf and will have improved by a good margin. We can almost guarantee too that they will want to continue further and play as much golf as they can! The course of lessons will involve a general understanding of the rules and etiquette of the game and then Matt will move on to the golf swing, short game, and putting. All the while keeping fun and laughs as the main priority! As part of the lessons and the range work, Taster members will not be required to have their own equipment or even have any golf apparel, they can just turn up in whatever they feel comfortable in and be ready to enjoy themselves and meet new people! If you’ve been looking for a new hobby, or if you’ve always fancied a crack at golf but never got round to it, now is the perfect time to start with our Taster Memberships! Pop into our clubhouse or download an application form to apply now! ON Saturday we hosted our Captain’s Drive-In Texas Scramble, after it was re-arranged due to snowfall on 2nd February. For those who don’t know, the Captain’s Drive-In is the official event where the previous Captains hand over to the incoming Captains for the year, and it’s always a great event. Around 25 spectators gather at the first tee at 7:30am on the morning to watch Our Men’s Captain Tony Howard, Ladies’ Captain Sarah Leonard, Seniors’ Captain Steve Alger and Men’s Vice Captain Dave Smith tee off on for their first official round of golf in their new roles. Fittingly, the Captains all had walk in music to the tee and I was the MC introducing them, and in true Burstwick fashion obviously tell a few jokes and giving some banter along the way. Our Professional Matt Daley had his Trackman launch monitor on the first tee so that the Captains could see shot data from what was rather a nerve-racking first tee shot in front of an audience, having just walked on to their chosen song! The competition, which was a Texas Scramble, attracted record numbers for the club as 109 players entered the event, a fantastic number for a club competition in winter! It was great to see such huge support for the incoming Captains. Afterwards members enjoyed a nice home-made stew and yorkshire pudding in the clubhouse and Tony was handed his Captain’s blazer, and told the club what his plans were for the year, as well as explaining about his nominated charity: Hull for Heroes. On behalf of the Captains, a huge thank you goes out to all the support from the members, and here’s to a successful 2019! Come to Nineteen Restaurant & Bar, near Hull, on Sunday 31st March and show Mum how much you love her. For just £18 you can enjoy a freshly prepared three course meal (or £14 for two courses), and mum gets a complimentary glass of fizz to say thank you for being the best! Children's portions are available, please ask a member of staff. This April we will be hosting the first annual fundraising Am-Am for our new professional Matt Daley. 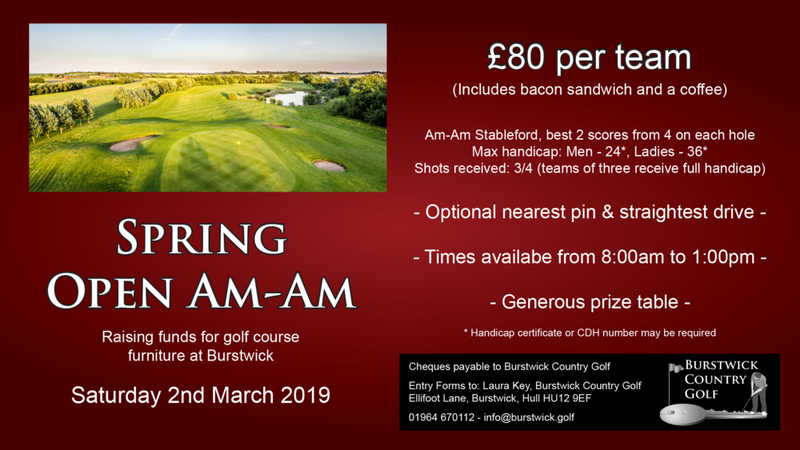 It is the first event of it’s kind to be held at Burstwick, and it follows on from when Matt held the same event when he was at Hainsworth Park Golf Club. The Am-Am is open to all players at any club as long as they have a valid handicap and entry costs just £20 per person, including a bacon roll and coffee! Matt’s Am-Ams previously were extremely successful and it looks like this one will be just as popular as we already have over 20 teams booked for the day. If you would like to take part in this event go online to www.opens.burstwick.golf and book your team in now! It’s been nearly three months since I joined the team at Burstwick, and it has flown by! I just wanted to take this opportunity to say thank you to all the members at the club who have made me feel very welcome, and already part of the family at Burstwick. The reception I have received since October has been humbling and I know that I haven’t quite met everyone yet, but I’m sure I will get to know you all at some point soon, it’s just that I have been putting every ounce of effort into the studio to make sure it was completed as soon as possible. Many of you will be aware that when I joined the club my aim was to create the best teaching facility in the whole of the East Riding area, with the best technology, knowledge and expertise, and I see this as a fantastic facility for the members of Burstwick, whether it be for lessons or for hiring with friends to play on the virtual golf simulator. The studio is now complete and I would love all of the members to come and have a look so if you see me in the clubhouse don’t hesitate to grab me and I will gladly show you around. Also I would just like to say a big thank you to Alan and family for their support and patience throughout, you have all made me feel so welcome and have been a massive help in my start at the club. So a huge thank you to all members, staff and family of Burstwick Country Golf. It means a lot! 25% off selected clothing in the Winter Sale! Price have been slashed on apparel in the Pro Shop with up to 25% off ticket prices, we've also reduced some of our shoes and equipment too so why not pop in and grab a bargain while stocks last? A sneak peak into Matt Daley's new Studio! This week Matt Daley’s new Trackman Golf Studio is now open and ready for use after a full refurbishment. There isn’t much that Matt hasn’t changed: flooring, walls, colour scheme, launch monitor, computer and four monitors, putting matt, couch and more! The place has a brand new feel and is much cleaner than the previous design, providing the best teaching and practice facility in the area with market-leading Trackman technology - the same that is used on the PGA Tour. The indoor simulator will be up and running this weekend and ready for golfers to hire for £25 per hour. This includes the ability to play 30 golf courses (including St. Andrews Old Course and Royal Troon), run Nearest the Pin competitions, play some Target Golf or just hone in your numbers and practice your swing by yourself. Matt has already been teaching an impressive number of lessons without the studio being in action, so he is very excited to get going in teaching golfers from all around the area in the facility from this week. 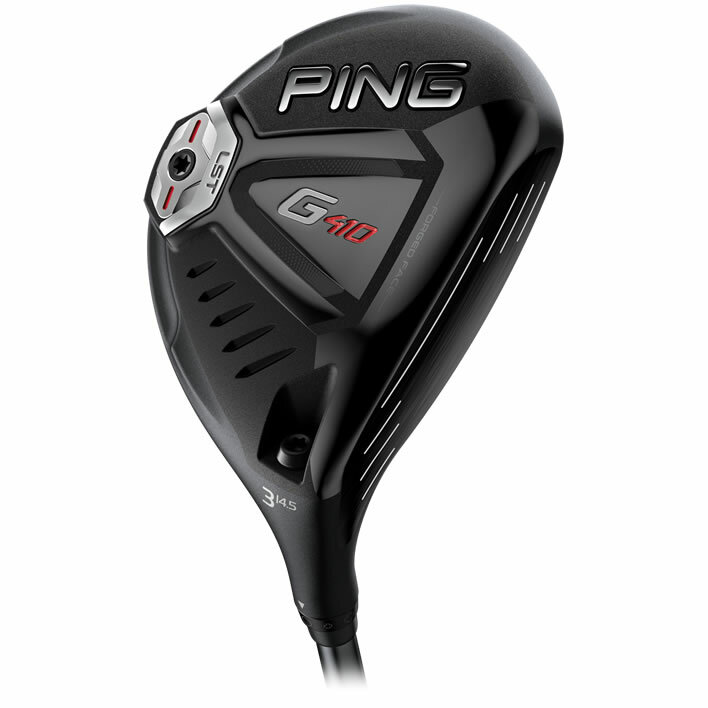 If you would like to have a look at the new studio Matt would be very happy to give you a free tour and demonstration of everything that can be done to help improve your game and also enjoy your golf in a warm, cosy environment, which is perfect for these cold and wintry days we are having lately. Give Matt a call on 07706 285296, email matt.daley@burstwick.golf or pop in and see him! Merry Christmas and a Happy New Year to all of our members from all of the staff at Burstwick, we hope you have a wonderful festive period! The new Rules of Golf from the R&A and USGA come into force from 1st January 2019 and it is important that golfers know about the changes if they are going to be playing competitively. This helpful video below gives you a fantastic overview of the 20 biggest changes in the rules, which will be the most commonly occurring in your game. Make sure you give this video a watch before the 1st of January if you are unsure of any of the new rules. Some of the new rules include the options for local rules to be enforced by the Committee at each club, and currently the Committee has no plans to enforce any of these, this includes and alternative penalty procedure for an out of bounds or lost ball; we will remain with the traditional method of going back to where the shot was last played from under a one stroke penalty. If you have any questions on the new rules please don’t hesitate to speak to either Alan or Matt at the club for any help or clarification.